Social pedagogy can be found in many countries around the world. 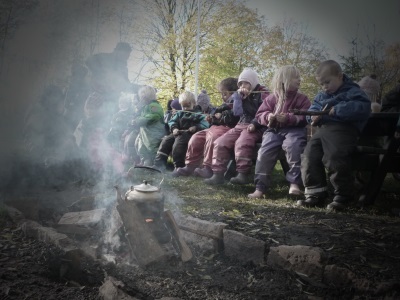 Although social pedagogy varies from one country to the next, there are similar roots that have developed into differing strands of contemporary thinking in social pedagogy. Hämäläinen (2003) explains that ‘historically, social pedagogy is based on the belief that you can decisively influence social circumstances through education’ – and importantly, education does not only refer to children but includes educating adults, for instance in order to change their idea of children. While philosophers of Classical antiquity like Plato and Aristotle discussed how education could contribute to social development, social pedagogy in theory and practice only emerged through the influence of modern thinking in Renaissance, the Reformation and later in Enlightenment (Hämäläinen, 2003), when children started to come into the picture of social philosophy. In the France of the 1700s, children were seen as mini-adults – they wore the same clothes as adults and their ‘childhood’ had little similarity with contemporary attributes of childhood as a cherished period of learning, a period of innocence and safety. Born in Geneva in 1712, Jean-Jacques Rousseau set out to radically change such social concepts with his educational philosophy. Concerned with the decay of society, Rousseau developed his theories based on his belief that human beings were inherently good as they were closest to nature when born, after which society and its institutions corrupted and denaturalised them. Consequently, Rousseau’s pedagogic theory was concerned with bringing up children in accordance with nature and its laws so as to preserve the good. His influential novel Émile, published in 1762, described the education of the fictitious character Émile in line with what Rousseau considered the principles of natural education, emphasising wholeness and harmony with nature. His intention was to preserve the child’s ‘original perfect nature’, ‘by means of the careful control of his education and environment, based on an analysis of the different physical and psychological stages through which he passed from birth to maturity’ (Stewart & McCann, 1967). With this concept of children as perfect due to their proximity to nature, Rousseau radically changed society’s notions that being a child was something to quickly grow out of and replaced it with something worth preserving in its unspoilt state. Whereas teaching – and education was reserved for a small minority of children – had previously aimed to form children into adults, Rousseau innovatively ‘argued that the momentum for learning was provided by the growth of the person (nature) – and that what the educator needed to do was to facilitate opportunities for learning,’ Doyle and Smith (1997) note. While Rousseau did not achieve to put his educational philosophy into practice, his groundbreaking ideas inspired many following pedagogues, notably the Swiss Johann Heinrich Pestalozzi (1746-1827), who refined Rousseau’s thoughts by developing a method of holistic education, which educates ‘head, heart, and hands’ in harmonious unity. Stimulating children intellectually and arousing their curiosity of the world around them would, as Pestalozzi stated about the ‘head’, form their cognitive capacity to think. The moral education of the ‘heart’ constituted the basic aim to ensure a ‘sense of direction, […] of the inner dignity of our nature, and of the pure, higher, godly being, which lies within us. This sense is not developed by the power of our mind in thought, but is developed by the power of our heart in love.’ (Pestalozzi, cited in Heafford 1967) As the third and complementary element, the ‘hands’ symbolise that learning is also physical, involving the whole body and all senses: ‘physical experiences give rise to mental and spiritual ones’, analyses Heafford (1967). The three elements ‘head, heart, and hands’ are inseparable from each other in Pestalozzi’s method: ‘Nature forms the child as an indivisible whole, as a vital organic unity with many-sided moral, mental, and physical capacities. […] Each of these capacities is developed through and by means of the others’, Pestalozzi argued (cited in Heafford, 1967). Based on Pestalozzi’s philosophy, his German student Friedrich Fröbel initiated the kindergarten movement, which raised international awareness of young children’s capacities for learning and inspired childcare and pedagogy of the early years at a large scale. Fröbel’s and Pestalozzi’s ideas sparked interest across continental Europe, culminating in the New Education Movement, which looked at ways of transferring these pedagogic concepts into various contexts: the Italian Maria Montessori, the Austrian Rudolf Steiner and the German Kurt Hahn all developed their own coherent educational philosophy and founded schools based on their principles; the Pole Janusz Korczak led two orphan’s homes with great respect to children’s rights and participation; and in youth work Montessori’s method was also practiced widely. Thus the New Education Movement contributed to a continental pedagogic discourse, which gradually established pedagogy as a way of working with children and young people. In this discourse, children came to be conceptualised as equal human beings – Korczak declared that ‘children do not become humans, they already are’ – and as resourceful, capable and active agents – the Italian Loris Malaguzzi talked about the ‘rich child’ stating that ‘a child has a hundred languages’. Furthermore, there was increasing recognition for child participation and children’s rights, for instance in the pedagogic method of Montessori and the ideas and practice of Korczak who was one of the leading children’s rights advocates and founded in his orphanages a Children’s Republic, where children formed a Children’s Court and a Children’s Parliament (see Lifton, 1988). The New Education made two fundamental points which demonstrate its ambition to use pedagogy for social change: ‘First, in all education the personality of the child is an essential concern; second, education must make for human betterment, that is for a New Era’ (Boyd & Rawson, 1965). In many European countries, these pedagogic concepts and philosophies fell on fertile ground and did not only inform future education in the classroom but also led to the provision of social pedagogic welfare services, growing into many different pedagogic approaches. Yet, even though the New Education Movement was very influential in England’s education, it did not meet the same social preconditions as elsewhere – it never evolved into social pedagogy which was never mainstreamed west of the North Sea and never became an integral part of society. This does not mean that the Movement has not left its imprints – Fröbel’s pedagogy for early years transformed the ideologies underpinning the way nurseries were subsequently run, which is why pedagogic ideas still form an important part of early years theory (e.g. Riley, 2003); furthermore, progressive child-centred schools began to open, including ‘Abbotsholme (founded in 1889 by Cecil Reddie), Bedales (founded in 1893 by J.H. Badley) and Summerhill (initially founded in 1921 by A.S. Neill)’ (IoE Archives, 2007: p.1). Especially in education, there has been great openness towards ideas of social learning, namely by the Russian Lev Vygotsky, and the Plowden Report (Central Advisory Council, 1967) is possibly the most outstanding example of attempts to adopt pedagogic ideas into school. But the ensuing changes in schools towards child-centred learning were politically and publicly seen as too radical in a culture where the Victorian notion that ‘children are seen, but not heard’ is still alive, which shows that cultural acceptance for pedagogy in this sense has overall been low. Although pedagogy was early on concerned with changing social conditions through education – Rousseau is most famous for his Social Contract (1762) – the term social pedagogy was first used by the German educationalist Karl Mager in 1844. One of the first key thinkers, Paul Natorp, ‘claimed that all pedagogy should be social, that is, that in the philosophy of education the interaction of educational processes and society must be taken into consideration (Natorp, 1889; 1907; 1920)’ (Hämäläinen, 2003: p.73). 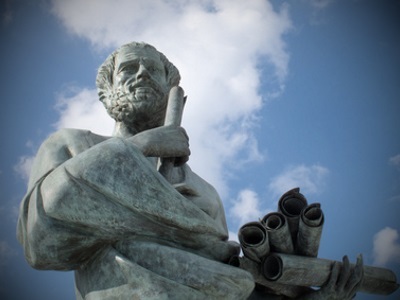 His social pedagogic theories were influenced by Plato’s doctrine of ideas, together with Immanuel Kant’s categorical imperative of treating people as subjects in their own rights instead of treating them as means to an end, and Pestalozzi’s method. In the 1920s, with influential educationalists such as Herman Nohl, German social pedagogy was interpreted from a hermeneutical perspective, which after World War II ‘became more critical, revealing a critical attitude towards society and taking the structural factors of society that produce social suffering into consideration’ (Hämäläinen, 2003). Consequently, contemporary social pedagogy in Germany is as a discipline linked more closely to social work and sociology than to psychology. Despite omitting to mention the central aspect of holistic education, both descriptions outline important aspects of social pedagogy. The prevalent understanding of (social) pedagogy in England – as described by the CWDC and the Thomas Coram Research Unit (Boddy et al. 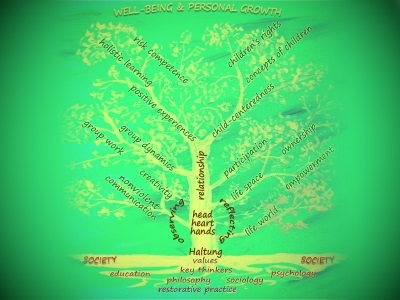 2006; Cameron 2005; Petrie 2004) – reflect the theory model of social pedagogy outlined by Nohl (1927), Bäumer (1929), and Mollenhauer (1959), who saw social pedagogy as an element of pedagogy that covers every education outside of school and family. Social pedagogy is for them theory and practice of child and youth services (Badry & Knapp 2003). Mollenhauer (1959) added a further aspect by stating that social pedagogy includes an element of social criticism, and according to Natorp (1909) attempts to influence the social system and optimise it (Badry & Knapp 2003). Even though it is vitally important for social pedagogy, this aspect is rather disregarded in the English understanding of pedagogy. Further, social pedagogy is an approach covering the whole lifespan of people, and with recognition to lifelong learning as well as social pedagogues’ person- and care-centred value base social pedagogy has become the preferred way of working with adults as well. 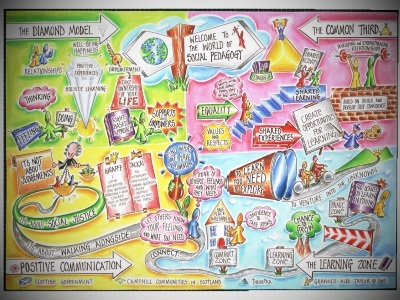 Considering the need for improvements in adult services – for refugees, prisoners, or older people in care, to mention but a few – the UK would benefit from conceiving social pedagogy in the broadest possible way and striving to implement it across all welfare services. So far, much of the UK discussion has centred on children and young people, predominantly on children in care (Boddy, 2003; Cameron, 2004-2006; Petrie et al., 2006) and to some extend on early years (Moss et al., 2000) and youth (Eichsteller, 2006; Paget et al., 2007). For a successful development across the lifespan it will be important to consider how social pedagogy relates to different types of welfare services.